Every time I opened the fridge, I stared, uninspired by the yellow squash (and might I add organic)- yes, sort of getting on the organic bandwagon. I personally don’t like yellow squash, the kids don’t like any vegetables lately. Ari throws them on the floor saying, “Disgusting” and Gia just moves them all over her plate- typical kids, hating their veggies- actually squash is a fruit- Did you know that? I just learned that from the Internet. But hubs bought the annoying squash- he sometimes does the grocery shopping, which he should really stop – I just got back from the second trip to the grocery store to get all the stuff he didn’t get…he goes on Sunday, when I am not in “work mode.” Too lazy to write a list, head a bit foggy from a slight hangover from usual Saturday night fun- oh yea- this mom still parties…granted the party scene is a bit different these days, my wingmen, are actually girls and they’re not super helpful with helping me score…they are more like the blocker types…with their late night crying and refusal to go to sleep. So, sick of looking at squash, I decided to make these muffins. I found the recipe on modernbeet.com. 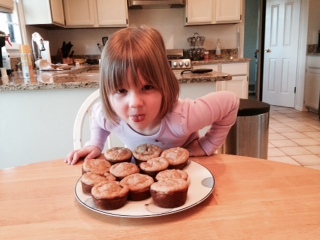 Here’s a pic of Gia and what she thinks of the muffins. But I did get her to eat one and she said she “loved them,” but only with a bit of jelly, of course. She is my sweet tooth. It’s funny because Gia doesn’t like chocolate and Ari does, but Ari rather have a salty snack and Gia prefers a sweet snack… Just goes to show you we are all so different. Anyway, I feel proud of my healthy muffins and use of yellow squash- See, I told you we were moving on from cookies and donuts! Sounds good! I never know what to do with squash besides grilling it!